KoopaTV: GameFAQs Best Year in Gaming: Round 5 — THE FINALS! GameFAQs Best Year in Gaming: Round 5 — THE FINALS! By LUDWIG VON KOOPA - The death match between 2001 and 1998. Throughout this month of May, KoopaTV has been covering the GameFAQs Best Year in Gaming contest. This contest sought to poll the Internet (this year, mostly just GameFAQs users — but in previous years there were rallies have caught Internet-wide popularity and massive vote totals) on which year in the gaming industry was... THE BEST. After getting through a Wildcard round, Round 1, Round 2, Round 3, and Round 4... we're finally at Round 5. In a 32 + 4 entrant 1v1 tournament, that's the final round. Our gratuitous banner has the propaganda directly put on it! It's 2001 vs. 1998. Vote for 2001. Please? Right here, today, on Monday. 2001 had three hardware releases: The Nintendo GameCube AND Game Boy Advance, as well as Microsoft's first foray into the gaming console business, the original Xbox. Both had strong opening salvos in their launch year, with Super Smash Bros. Melee, Golden Sun (and Gyakuten Saiban in Japan! ), and Halo respectively...as examples. 1998 had... the release of the Game Boy Color. I mean, that's important, but... it's technically a hardware revision. Isn't it weird how Nintendo didn't do anything with the Game Boy for about a decade, and then finally they just release a Color version? Clearly, 1998 loses, especially because 2001 has the Game Boy Advance. You really just care about games, don't you? Okay, but just be aware that I think the GameCube was the best console ever. The match pictures featuring 12 games each for 2001 (left) and 1998 (right). 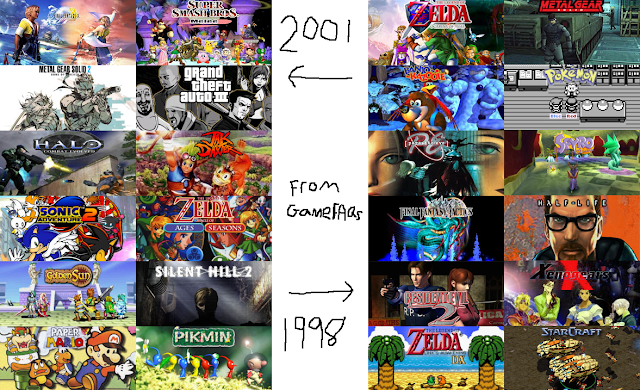 ...This doesn't even go through the full worth of 2001, but 1998 is pretty much represented! As discussed, 2001 had Super Smash Bros. Melee and Halo, but Sony fans also got Final Fantasy X, which is a very influential and well-received Final Fantasy. Halo revolutionised console first-person shooter games, and had a very deep single-player mode (that was the centrepiece, along with The Legend of Zelda: The Wind Waker, of a literature presentation/report I once did on the flood archetype — clearly it's deep! ), along with extensive multiplayer. This combination is why Rawk name-dropped Halo as a shining example of a game that gets game modes right, as we were debating at the end of the ARMS Nintendo Direct reaction log just a few days ago. In the same reaction log was a discussion about Sakurai checklists and Event Matches — a reference to Super Smash Bros. Melee. Super Smash Bros. Melee is a major player in the gaming space to this day, thanks to its enduring eSports presence. But, as seen by its casual mention a few days ago, it's not just a competitive darling but also a casual one: A game with the right balance of features that appeals to gamers of all kinds. Again: People still play it to this day, and it's been hugely influential. But, but, BUT. 1998 is far from a stranger to influencing the gaming industry. With titles such as Half-Life (which revolutionised the PC first-person shooter genre), Pokémon Red and Pokémon Blue (which created a huge cultural wave in the United States of America in 1998, was subsequently banned in Iran, and later took over Inkopolis for a weekend in 2015), and... well, the elephant in the room, The Legend of Zelda: Ocarina of Time, a game that I can no longer avoid name-dropping. It's widely considered the best game of all time, which is something I dispute (you see The Legend of Zelda: Oracle of Seasons and The Legend of Zelda: Oracle of Ages on 2001's side? I like those more), but, hey, it certainly has massive influence. It brought Z-targeting into the industry, and many, many articles have been written (...just... not on KoopaTV) about how it's influenced many game developers and lives. I was going to ask, “Does anyone still play [insert 1998 game here] today?” ...The answer is probably “yes”, so that doesn't help make my point. I will say, though, that more people watched Super Smash Bros. Melee at big tournaments like EVO 2015 than simultaneously participated in Twitch Plays Pokémon. Obviously, I can't factually prove 2001 is the better year, but, I can say, from my personal preferences, I like 2001 a lot more. A lot of the reasons people like 1998 more are for games on the PC, which, hey, I've never been a PC gamer. 2001's depth comes from the console and handhelds, which are more my cup of milk. There really are multiple things in the year that are truly memorable, enjoyable, and enduring for everyone. Not mentioned yet in this article: Paper Mario, Mario Party 3, Pokémon Stadium 2, Pokémon Crystal, Metal Gear Solid 2, Grand Theft Auto III, Sonic Adventure 2, Advance Wars, Wario Land 4... even Tony Hawk's Pro Skater 3! I could make a similar long list with 1998, but it'd make me smile less. Of course, Metal Gear Solid and Banjo-Kazooie have big fans in the world and on this site, and Vortexica loves Spyro the Dragon. We're talking the original games there, not just the franchises, but games that are held up favourably to this day. Yet, in that same article with Spyro, I mention Mario Party 3 (and I call out 2001 as a year, specifically) and Kamek sort-of mentions Pokémon Crystal! Before this closes, I need to clear up this longstanding misconception: I don't hate The Legend of Zelda: Ocarina of Time. I just think it's overrated. It's a good game. I actually enjoyed being put on hold to the Hyrule Field theme when I called Nintendo two years ago. But it's not my favourite, second-favourite, or even third-favourite game between 2001 and 1998. It might be my favourite release from 1998, though. I don't know how much of a statement that is. 1998 was fantastic for many people. Just not me. It was merely... good. You are certainly free to disagree with Ludwig (and maybe some of the staff members of this site do, though he didn't ask any of them in the making of this article), but if you do, don't go to GameFAQs and vote. 2001 is probably going to lose anyway! Help the underdog! I'm voting for 2001 too, only because of the fond memories of playing Melee with all my buds at the time. There were some wild nights, where at sometime around 10 pm we'd decide that we should all just stay up all night anyways, and then go and get 3 or 4 cases of Pepsi and Mountain Dew to fuel our sad little smash party. Also, my secret shame. I used to really REALLY love that Sonic Adventure Battle 2 game- I even had my Chao maxed out for Karate, racing, everything. Ugh. It was the best of times, it was the worst of times. 2001 gets my vote! Well, we're only part of the 34%. I did not own a Gamecube but my cousin did and I always cherished the times we played Melee whenever I visited. Excluding the Gameboy Advanced, the GC was the first home console that really introduced me to gaming. For that reason alone, 2001 is the winner to me. I'm glad we can have an alternate universe here on KoopaTV where 2001 was the winner.